If you are into birdwatching, your hobby is literally for the birds! 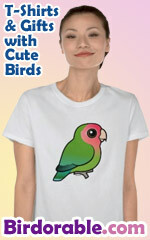 Cute birder tees & gifts. Work w/ birds? Great gifts for vets, ornithologists, wildlife managers and anyone else working w/ birds! If you're a birder, chances are your weekends are literally for the birds! Here's your weekend shirt, then.